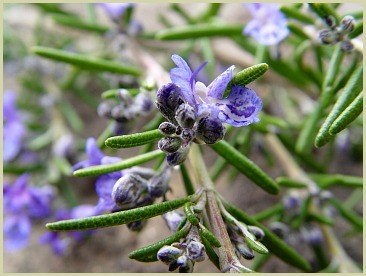 Not only is it tasty with chicken, fish and potatoes, but growing rosemary is fairly easy in any climate! And growing it yourself will ensure a year round supply of the freshest, tastiest leaves for use in your cooking all year round! Originally native to the rugged shores of the Mediterranean Sea, rosemary plants thrived in the rocky soil and sun-soaked climate, and needed only the water in the sea mist and air to survive. They can grow for 20-30 years and reach heights of 6 foot plus! This is the reason it's often referred to as a rosemary tree. Read more about this. But probably the easiest way, from young plants purchased from a garden centre or nursery. 4-6 weeks before the average date of the last frost in your region, sow the seeds in seed trays using a seed compost. Water, and leave to germinate indoors in temperatures of 25-30°C (75-85°F). Once germinated, which can take up to 6-8 weeks, water infrequently and plant outside a couple of weeks after the last frost date has passed. Water regularly, but sparingly and pay attention to how moist the soil is. Don't overwater! And that's pretty much it! It doesn't need feeding, though a liquid feed after flowering is a good idea. Once your cutting has some nicely established roots, transplant it into a container. In the spring, when the threat of frost has passed, you can continue growing outside. It’s a plant that likes heat and enjoys shelter, so pots of rosemary do well near a garden wall, or on a patio. This is a good way of growing rosemary if it gets too cold in your region as you can move the containers closer to the house for added protection during the colder weather. Fill your container with a mixture of general potting compost and sharp sand as it needs to be well draining. Plant your cuttings (see above). Water well but sparingly in hot weather and give them a feed after they've flowered. Early spring: Sow seeds indoors. Spring: Cut back older plants and take new cuttings. Plant out seedlings and purchased plants. Summer: Feed after flowering. Trim back if straggly. Winter: Add mulch, straw or protective fleece to young plants. Move containers nearer to the house or against a south or SW facing wall. As it's an evergreen, you can pick the young leaves all year round as long as you don't overpick. With your fresh leaves, I do recommend you try my tea recipe. It's very tasty and healthy.